It has been 350 years since Robert Hooke published Micrographia, and revealed the microscopic world that had been previously invisible to the masses. Micrographia was the first scientific best-seller, and made science both accessible and popular to an entire generation. Much of what we know in the sciences today can be traced to the text and plates in Micrographia. In fact, clear lines can be drawn from any significant microscopical finding today to Robert Hooke’s observations in 1665. Far beyond documenting observations and intriguing readers, Hooke’s greatest accomplishment may have been the inspiration he provided to those who pursued science after seeing the world Hooke had described and illustrated. Hooke influenced the way we understand light and construct modern microscopes. Incorporating what was learned from Hooke into new challenges has led to successive specialized microscopes. Scientists today use computers, electrons, photons, and infrared rays which account for an improved quality of life across the world. Notably, the 2014 Nobel Prize winners in chemistry again revolutionized microscopy by developing a way to observe living cells without damaging them. As we rely on science to describe and understand the world around us, our fascination with the microscope continues to be illuminated. In the science community we constantly see more efficient and powerful instruments entering the market place. Yet, in the scurry to find solid answers to big questions, at Hooke College of Applied Sciences, we could not help but find ourselves intrigued with the Foldscope™. The Foldscope is an origami-based light microscope made by folding cardstock and attaching a spherical lens housed in a plastic tray. 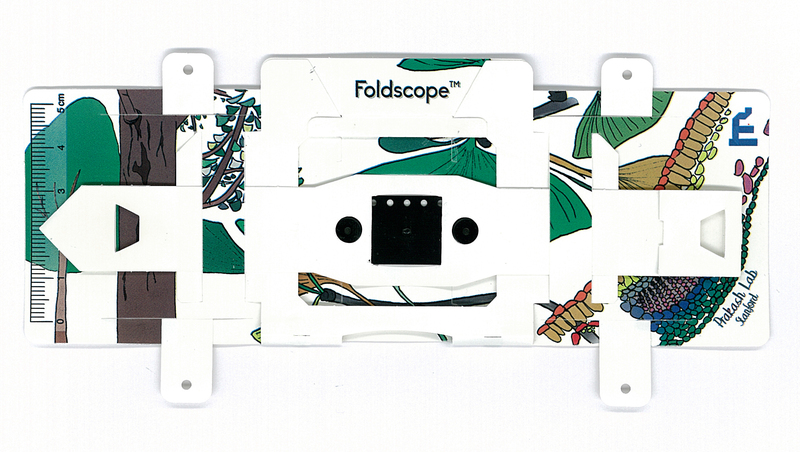 Manu Prakash, Foldscope creator, envisions the Foldscope serving a wide range of applications in field science and education. With a focus on providing health workers with efficient tools when working in remote areas, and making possible the dream that “every kid in the world should carry around a microscope,” Prakash stands to again popularize microscopical science for a new generation in a way that Hooke was able to do through pictures. Like Micrographia, the Foldscope provides a glance into a miniature world for those who have no other access to magnification. 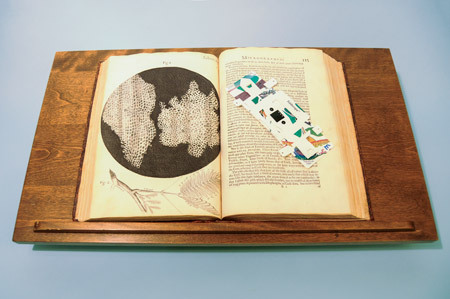 For these people, the three-pound book will be replaced with an eight-gram window—opened by a tiny sapphire lens housed a in fifty-cent durable plastic microscope that can magnify up to 2000X and be outfitted with filters that reveal the characteristics of tiny materials. Hooke College of Applied Sciences is excited to have been selected as part of the field testing of the Foldscope. During our teacher camp in June teachers will have the opportunity to interact with Foldscope and provide critical feedback that will further develop the Foldscope and open new frontiers in making microscopes accessible to everyone. Just as Micrographia inspired the science of today, we imagine that by arousing curiosity, the Foldscope will inspire the science of tomorrow. Do you have one to try out? I think you or Chuck might want to give a talk to SMSI! !